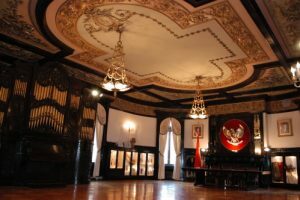 The Historic Embassy Building – Embassy of the Republic of Indonesia | Washington D.C. 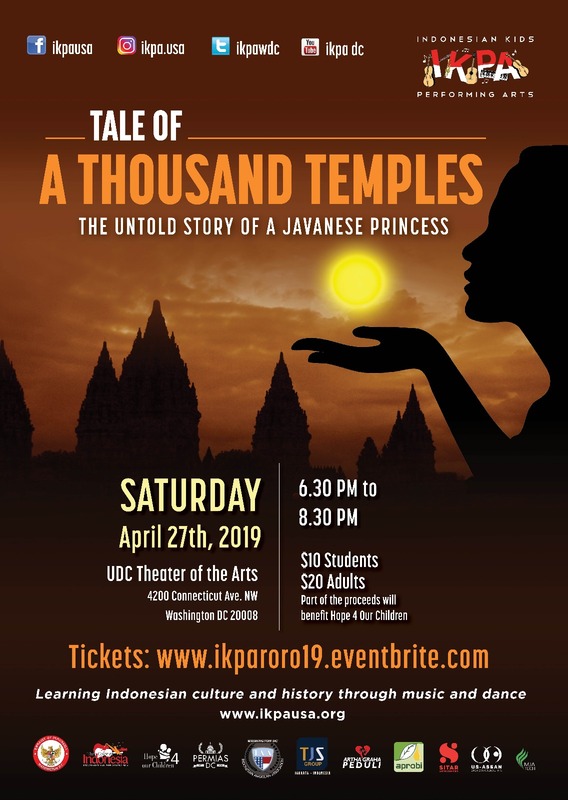 The mansion that houses the Embassy of Indonesia has an amazing history. 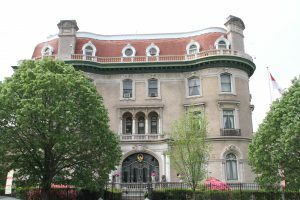 From gold prospectors to the Red Cross, the Hope Diamond to mysterious ghosts, many interesting figures and organizations have called the mansion home. In an account that was originally published in the Jakarta Post , former Embassy official Mr. Abdullah Balbed recounts this history below. 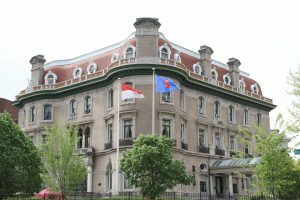 The Embassy of the Republic of Indonesia occupies the former Walsh mansion, located at 2020 Massachusetts Avenue along Washington , D.C.’s “Embassy Row.” Built as a private residence at the turn of the 20th century, the building is now known as a historic landmark in the nation’s capital. The extreme wealth and colorful lives of its original occupants have added to the mansion’s historical interest. 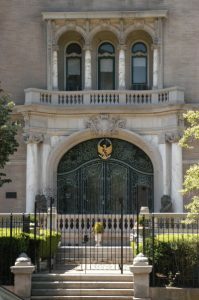 The building is one of several Beaux-arts mansions on Massachusetts Avenue built by the more affluent inhabitants of the capital. Between 1890 and 1930, American high society was greatly influenced by the École des Beaux Arts in Paris . The architecture of the Walsh mansion reveals both this period’s character and the personality of the owner. The building is listed in the National Register of Historic Places . Thomas F. Walsh, the mansion’s first owner, was born in County Tipperary, Ireland and immigrated to the United States in 1869 at the age of nineteen. Starting off penniless, he eventually made a fortune moving out west in Colorado’s gold mining industry as the sole owner and developer of the Camp Bird mine at Ouray , Colorado. At the time, it was one of the richest gold mines in the world. While still a prospector, Mr. Walsh married the former Carrie Bell Reed who bore him a daughter in 1886 named Evalyn and a son in 1888 named Vinson. Toward the end of the century, the family moved from Colorado to Washington , D.C. to be at the center of power and politics. Records show that they purchased the site of the future Embassy on April 30, 1901, in the exclusive Dupont Circle neighborhood known then for some of Washington’s most affluent families. They hired architect Henry Andersen of New York to draw up plans. Construction on the mansion began soon thereafter and the Walsh family moved in during the fall of 1903. In total, the mansion cost around $850,000 (the most expensive residence in the city at the time). The dinner table was adorned with yellow orchids of a very beautiful variety, their coloring being the keynote to the superb decoration of the board, where a service of gold made from glittering nuggets taken from the Camp Bird mine, was used for the first time. On another occasion later that month, the pair hosted a small ball and cotillion in honor of Alice Roosevelt, the daughter of President Theodore Roosevelt. Later, Mr. Walsh had an apartment on the third floor of the residence refurbished in preparation for the visit of King Leopold of Belgium. Although the king was unable to come to the United States , his next-in-line did. King Albert and Queen Elizabeth arrived on October 28, 1919 for a three-day visit. Vice President and Mrs. Marshal, acting on behalf of President Wilson (who was ill at the time), hosted a state dinner at the Walsh mansion. After dinner, Queen Elizabeth presented Mrs. Walsh with the “Order of Elizabeth, Queen of the Belgians” for her Belgium relief work. During World War I, Mrs. Walsh had opened the mansion to Belgium relief volunteers. Although Mrs. Walsh occupied the house until her death in 1932, the property’s title had been earlier handed to her daughter Evalyn. As the daughter of a wealthy socialite couple and the wife of influential newspaper owner Edward B. McLean of The Washington Post, Evalyn Walsh McLean was well-known in Washington. The couple had four children, Vinson, Edward, John, and Emily. Evalyn inherited the house, but left it vacant for a time while she lived at “Friendship,” the McLean family’s estate in Washington , D.C.
Evalyn Walsh McLean is also distinguished as the last private owner of the fabulous 44 ½ carat Hope Diamond – the sale of which was negotiated at the Walsh Mansion by Pierre Cartier, the famous jeweler. Now in the Smithsonian Museum of Natural History, the Hope Diamond is a blue-colored Indian diamond which, according to the Encyclopedia Britannica, is probably a portion of a stone once stolen from the French Crown Jewels. Many have attributed the family’s misfortunes to the speculated curse of the Hope Diamond. After Mrs. Walsh’s death in 1932, Evalyn allowed the U.S. Government to begin using the property. The mansion was occupied in 1936 by the U.S. Suburban Resettlement Administration; in 1937 by the U.S. Rural Electrification Commission; and from 1941 to 1951 rent-free by the American Red Cross. Red Cross women manufactured surgical dressings and set up classes for nurse’s aides in the building. 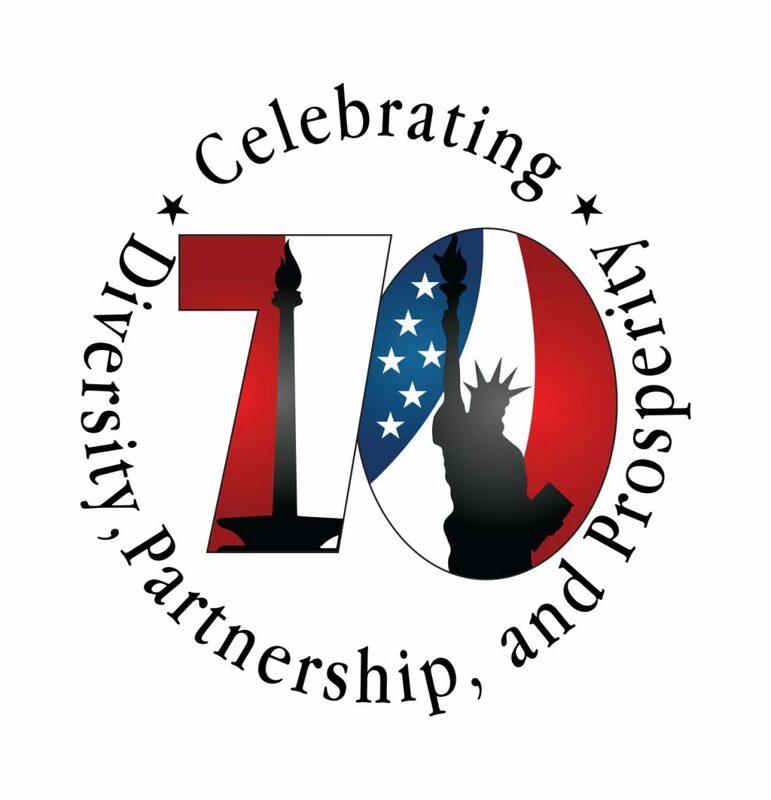 On December 19, 1951, Dr. Ali Sastroamidjojo, Indonesia’s first Ambassador to the United States, purchased the building at 2020 Massachusetts Avenue on behalf of the Government of Indonesia for its use as an embassy. It cost $335,000, or less than half the 1903 construction price. 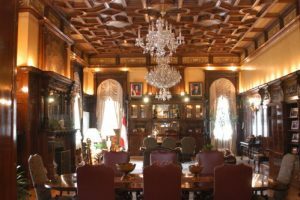 The Indonesian government spent an additional $75,000 to preserve the massive 50-room mansion and restore the character of the original interior decoration. Once restored, the Walsh mansion became Indonesia ‘s home in the United States. The building’s high, arched doorway has ornate grille-work over its huge plate-glass doors, reflecting a rich and flamboyant style. The Indonesian coat-of-arms now hands over this assembly. The entrance is framed by Ionic columns of green-veined marble and two demon-like statues from Bali . These statues are believed to possess the power to ward off evil and attract good. The main entrance opens unto an expansive rectangular hall at the heart of the building, with a grand central staircase reminiscent of an ocean liner. The open space and the light from above draw visitors’ eyes skyward to the stained glass skylight, which covers the entire ceiling area. A second, protective skylight guards this ornate structure from the elements. An artistic expression reminiscent of the late 19th or early 20th century, the decorative skylight illuminates the center of the building. The grand staircase in the middle of the central hall forms a “Y” shape. At the first landing stands a marble statue of two Roman dancers, a remnant of the mansion’s original furnishings. The staircase extends from each side of the statue to the second floor, ending in a promenade gallery. The floor layout on the third level is similar, so that looking over the railings on either side of the gallery reveals the floors below. The rooms on the first floor are large with high ceilings and display magnificent pastiches from European models of ornamentation. To the left of the main entrance is the Louis XIV Salon, formerly used as a drawing room and now used for formal functions. In October 1999, Ambassador Dorodjatun Kuntjoro-Jakti renamed this room the “Presidents’ Room” – a name taken from the prominent photographs of Indonesia’s first four presidents displayed within. Adjoining the ornate Presidents’ Room is the music or organ room, so called for its massive Baroque wood organ built into one wall. The walls have a gold-colored damask which enhances the room’s dark woodwork. Richly carved cabinets are built into the walls. Behind their glass doors rest collections of silver-work, curios, sculptures, batik, and Indonesian art from various Indonesian islands. The Indonesian coat-of-arms, a golden eagle or Garuda , hangs over the mantel of an elaborately carved fireplace on the south wall. The eagle is a symbol of creative energy. Its principal color – gold – suggests the greatness of the nation; its black color, nature. There are 17 feathers on each wing, 8 on the tail, and 45 on the neck, signifying the date of Indonesia’s proclamation of Independence – August 17, 1945 . The state motto of Bhinneka Tunggal Ika (“Unity in Diversity”) is enshrined on a banner clasped in the eagle’s talons. This old Javanese motto was introduced by Empu Tantular, a saint of the Majapahit Kingdom , in the 15th century. 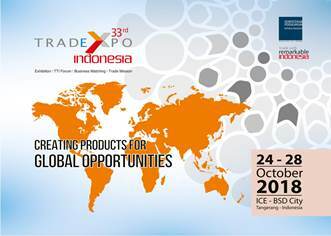 It signifies the unity of the Indonesian people despite their diverse ethnic and cultural backgrounds. 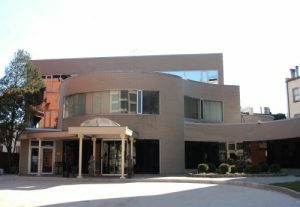 In June 1982, Ambassador Ashari Danudirdjo inaugurated a new building adjacent to the old mansion to serve as an expanded office area. Designed by the Architects Collaborative of Cambridge, Massachusetts, the new building is a crisp exercise in modern art. Passing from the old building into the new structure can be mildly overwhelming at first. Later, the eye turns with a certain relief from the profusion of curves and ornament in the old mansion to the sharp simplicity of the new building. Embassy tours are offered to the general public during regular office hours by appointment only. Please send your request by email to socialmedia@embassyofindonesia.org to make an appointment.